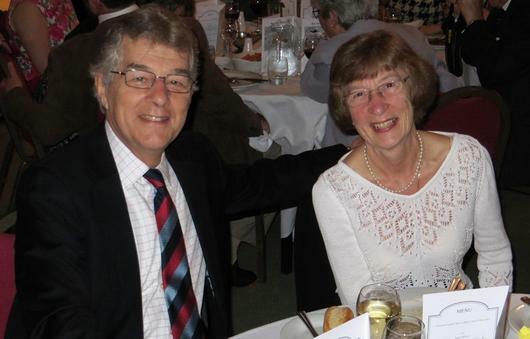 The turnout at the Petwood Hotel was one of the highest the Association has managed in recent years with just under 70 people attending the meal. Other ME846 family members present were Paul and Gill Stevenson. 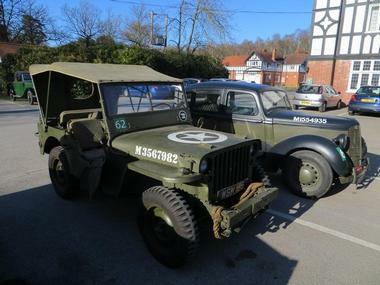 As well as visiting their usual locations such as the William Farr School, Thorpe Camp Visitor Centre etc. the Association members had a good visit to the BBMF at Coningsby on Friday afternoon. They also benefited from several Lancaster flypasts as the BBMF were undertaking their final practice session for the 2013 display season. 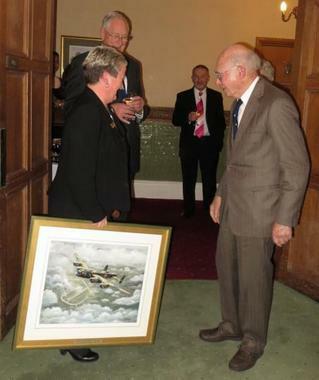 During the evening two paintings were presented; one from the 619 Squadron Association to the Petwood and a second from Roger Olden to Joe Dutton. As ever lots of stories were told, memories shared, with acquaintances made and renewed. There was also talk about a possible Association trip to Austria in 2015 in connection with a possible new memorial to another 619 Squadron crew - more details about that will follow when we receive them from Joe Dutton. It is pleasing to note that the Association seems to be flourishing despite the inevitable dwindling in the number of squadron veterans still able to participate. We Will remember Them! In the January newsletter there was a small item about Jim Humphreys. You may recall that Jim was Australian Ambassador to the OECD in Paris and has served as Australian Ambassador to Denmark and later, Ambassador (High Commissioner) to Canada. Last summer Jim and his wife Madelien visited Nottinghamshire and the Newark Air Museum. Jim's brother, Bruce had trained with 1661 HCU at RAF Winthorpe in 1944, but was sadly lost with his crew on 17th April, 1944 whilst flying out of RAF Syerston, Notts with No.5 Lancaster Finishing School (LFS). A visit was arranged for Jim to RAF Syerston so he could see where his brother had taken off from. Through various local contacts we have helped Jim to find out a little more about what happened to his brother and crew. P/O B L Humphreys RAAF was the pilot of Lancaster I, W4232 RC-Y which took off from Syerston at 1601 hours for general flying training. Shortly after take-off eyewitnesses saw the aircraft stall and as it fell the port main-plane and starboard wing tip were reported to have come off the aircraft. 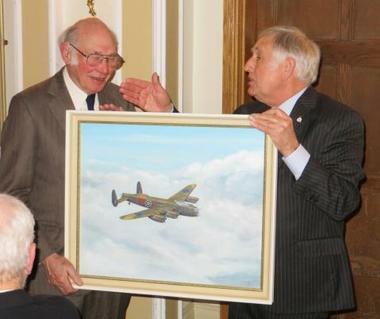 While in Nottinghamshire Jim was even able to meet a local resident who while working as a Land Girl had witnessed the crash; fittingly this meeting took place on the same day that the Bomber Command Memorial was unveiled in London. 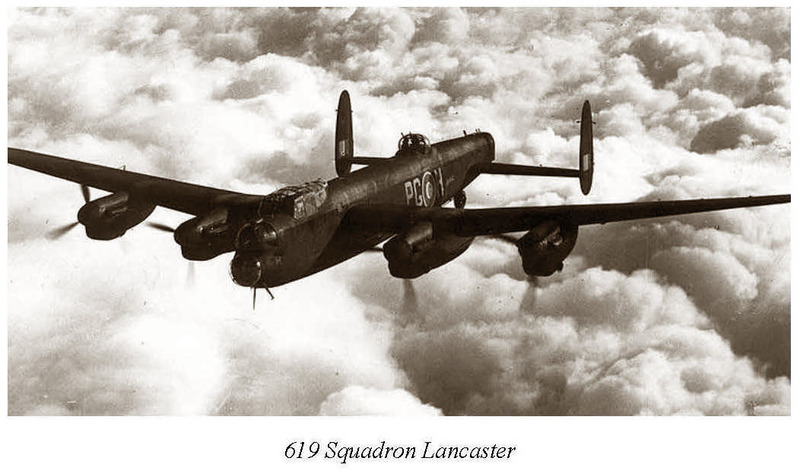 Jim is especially hoping to obtain a copy of any existing photograph(s) of the crew as a whole or, indeed, any photographs of some or all of them during their Lancaster days. Any leads or feedback would be greatly appreciated. 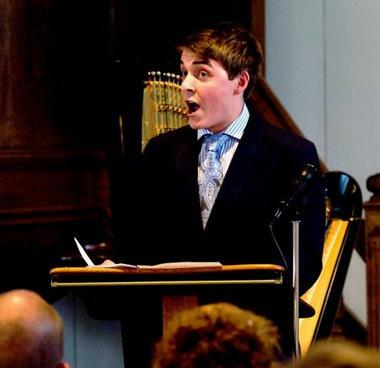 This is the name of a new book that is being published by Chris Keltie and it has strong connections to the ME846 Family. Riding In The Shadow Of Death, tells the story of Lancaster bomber pilot Bill North, who with his crew trained at 1661 HCU at RAF Winthorpe before moving on to Ops with 61 Squadron at nearby RAF Skellingthorpe. This crew was training at Winthorpe (pictured below) at the same time as our ME846 crew and bonds between Peter Knox and George Moggridge and Bill North's crew feature in the book. Jane provided some additional background details about the connections to the crew featured in Chris Keltie's book. One of the most important aspect of the ME846 link, concerns Norm Jarvis standing behind Peter Knox on the far left of the photograph below. Norm was Peter Knox's best man and he was with him in the Bomb Aimers photograph at Penrhos, Wales. 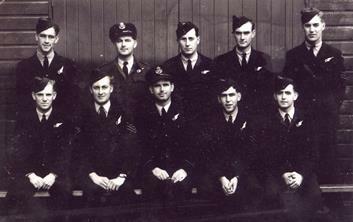 Royal Australian Air Force - Bomb Aimers 115 A stationed at Penrhos Wales 1943. Peter Knox appears often in Norm Jarvis's diaries and they were great friends. The other exciting news here is that his daughter Pam Livingstone will be coming over from Australia with her husband Rob, for Chris Keltie's book launch. She provided Chris with all her father's log and diaries and has contributed greatly to his book. The Moggridge story was also unbelievable. 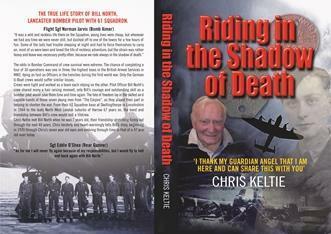 At Newark Air Museum on Sunday 16th June, as part of Cockpit-Fest 2013 the museum will be hosting a book signing event and talk by Chris Keltie. This will be the third in a short series of launch events for the new book. "This is the amazing true life story of Lancaster Bomber Pilot Bill North, who served as a pilot with RAF Bomber Command's 61 Squadron during World War Two. His story is told by Chris Keltie, who as a 7 year old boy met Bill and his family after moving into the house next door in London, March 1970. After completing many successful bombing missions on military targets, Bill and his crew were shot down on a night raid in Northern France. Bill could have saved himself by bailing out, but one of his crew members was without a parachute. Though wounded, Bill had to make an amazing, virtually blind crash landing in order to save his crew. In Bill's words: "I have still yet to meet a Lancaster Pilot who survived a night time crash landing in occupied territory." Bill was taken prisoner by a German Luftwaffe Officer and ended up at Barth Stalag Luft 1 on the Baltic coast. The rest of the crew ended up deeper into Germany in Stalag Luft 7. In the face of adversity, the bond between crew members serving in the RAF was phenomenal. The same was so for Bill and his crew who survived 17 missions out of the normal tour of duty which was 30. All crew members stated that there was no pilot better than Bill North, and no one that they would rather have flown with and put their trust in. This book weaves together a fascinating mixture of historical, political, social and cultural events from the turbulent 20th Century. A story of survival and comradeship, it will not fail to move and touch your soul." Copies will be available from the Museum Shop, with p & p rates on application. Neil is looking for photos of the crew or contact with relatives and he tells the story of the crew of Lancaster ND389. The first mention of the crew I have found is 13 October 1943 where they were identified as having been at 1660 Conversion unit at RAF Swinderby. Here they were learning to fly four engined bombers, having first been together as a crew on two engined aircraft, most probably a Wellington but possibly a Whitley. 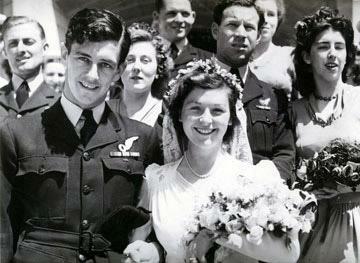 On the 13/10/43 they left Swinderby to join 61 Squadron who were based at RAF Skellingthorpe outside of Lincoln. This squadron was part of 5 Group. They flew their first Operation 03/11/43 to Dusseldorf. They remained with the squadron until 30/04/44 and flew Operations to Modan, flew on operations to Berlin 5 times, plus Frankfurt, Stettin and Brunswick - so they were very much a part of what came to be known as 'The Battle of Berlin'. 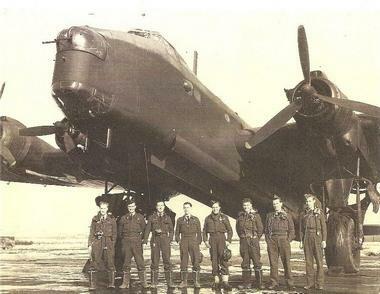 If they had stayed with 61 Squadron and completed 30 Operations then they would have completed a 'tour', however during this period Bomber Command was experiencing very heavy losses and the chances of a crew completing their tour was very slim - and all crews were all volunteers. At some point whilst they were with 61 Squadron they must have volunteered to join a Pathfinder Squadron, this would have meant even more operations before they were considered to have completed their tour and as such the chance of survival became even less. They would probably have been considered as an 'above average' crew in terms of competence. On the 3st if January 1944 they went to Pathfinder Force Navigation training unit to spend 2 weeks learning the role of a Pathfinder. They joined 83 Squadron in mid February 1944 who were part of 8 Group, and were based at RAF Wyton. As well as some familiarisation exercises at the airfield they flew a number of Operations - Leipzig, Stuttgart, Frankfurt, Essen, Lille and another 2 Operations to Berlin. I believe that during late March/Early April 1944 they may have had some leave. On the 11th of April 1944 they were down for an Operation and took off at 20:46 from Wyton, flying Lancaster ND389 OL-A as part of a 341 strong Lancaster force aiming to Bomb Aachen. At approximately 22:08 a German Nightfighter Pilot took off from St Trond Airfield in his BF110, he was with Luftwaffe Nightfighter unit 4/NJG 1, his name was Heinz-Wolfgang Schnaufer, he was a highly decorated Pilot and eventually finished the war having shot down over 120 RAF Bombers. The aircraft climbed to 5000 metres and at 23:05 the German Radar Operator got a signal, which turned out to be Lancaster ND389, the aircraft moved closer, behind and probably slightly under the aircraft where it could not be seen and at 23:15 opened fire on the Lancaster. It appears that it was a very successful attack and took the crew by complete surprise (it was possible that Schnaufer was using up ward slanted guns known as 'Schrage Musik'). The aircraft caught fire immediately and according to my eyewitness started to burn quite fiercely. As it was on its way 'in' it would have been still carrying a heavy load of fuel and bombs. "When you go home, tell them of us and say: for your tomorrow we gave our today." My name is David Greenley. Whilst researching my family history I found out that my namesake and first cousin, 1 x removed, David Greenley lost his life during a mission with 619 Squadron over Germany in 1944. I got in contact with Joe Dutton via his son in law, Simon Wootton and he was kind enough to send me more details about LM209 and the missions flown. At first I had no idea of what he looked like but eventually found another family researcher and relation, who was able to furnish me with a photograph of David. In tribute to him, his fellow crew members and Squadron 619, I would like to dedicate this to all of those brave men who served in the Armed Forces. Actually, it would be nice to have photos of the other crew members and so would appreciate it anyone can furnish me with any so that I can include them in the video. 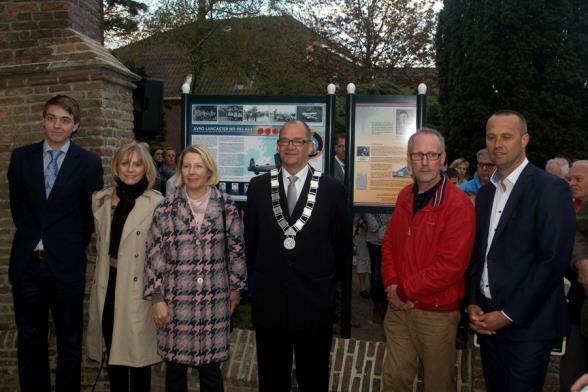 The appeal in the April newsletter for crew photos for the display board in the memory of a crew of Avro Lancaster Bomber, ND956 AS-1 at Gourdriaan in the Netherlands, was ultimately successful. This enabled the display board to be completed and this was unveiled on May 4th. ?great nephew of Jacky Moffatt. The ME846 family was represented at the ceremony and we have included a few photographs from that commemoration. A full report will be included in the next edition of the newsletter.